British Rail was the subject of an extraordinary experiment at the hands of the Tory government of 1992-7. It was hurryingly broken up into 100 parts and privatised in away that had never been tried anywhere else in the world. This book traces the roots of that government’s most contraversial privatisation and its consequences. It is a devastating account of what turned out to be a complete disaster, quite literally in the case of a series of fatal accidents which had their roots in the botched privatisation. In the aftermath of the Hatfield rail crash of October 2000 the railway system was reduced to a state of chaos from which it has still not fully recovered. And it was not just the passengers who suffered: Railtrack, the company that actually owned and managed the tracks, was transformed from a stock market star into a financial basket case; most important of all, as this book makes clear, the folly of splitting the national railway system up into a labyrinth of privatised companies, each seeking to profit at the expense of the others, was exposed. Setting his analysis within the broader historical context of Britain’s railway industry, Christian Wolmar shows that Hatfield, and the earlier accidents at Southall and Ladbroke Grove, were merely the symptoms of the dysfunctional structure that had been created by privatisation. The book nonsenses those who cherish a nostalgic view of a golden age of rail, explaining that right from the start Britain’s railways were struggling because of the free market obsession with competition. Instead of a rationally planned national rail network, like that laid out by many continental governments, Britain ended up with an eclectic system which never reflected need, nor convenience. The private companies struggled for years to make a reasonable profit, until finally being put out of their misery by the 1945 Labour government after the Second World War. Though nationalisation did not dramatically improve matters. For many years, British Rail was crippled by charges related to the extremely generous buyout of former shareholders. And it suffered from Treasury “stop-go” funding and neglect as postwar politicans fell in love with roads. John Major and his colleagues destroyed British Rail which, the book argues, was in fact managing much better than is acknowledged and was well on the way to creating the most efficient railway system Britain had ever known, despite the failure of successive governments to engage in the long-term planning necessary to create a world-class railway. It was replaced with a Byzantine system in which hundreds of staff are employed simply to argue with each other about the responsibility for every delay, where knowledge which might improve the efficiency and safety of the network is not shared but ealously guarded, and which requires more public subsidy than the ‘inefficient’ nationalised system it replaced. The sorry tale of rail privatisation takes up the majority of the book. A chapter is devoted to analysing each of the disasters at Southall, Ladbroke Grove and Hatfield. Christian Wolmar concludes that privatisation played a role in each, and that Hatfield could not have happened except on a privatised railway. But he is also unfashionably willing to point out that deaths on the railways are at an historical low. The result is the present situation in which the train operators have lost a large slice of their market; the maintenance of the track is in the hands of contractors who grow rich while employing staff who are often inadequately trained and qualified; and, because Railtrack (now renamed Network Rail) – the one company that is indispensable to the entire system – is entirely reliant upon further injections of public funds, the government now finds itself with all the financial responsibilities it had under the nationalised system while lacking most of the power. 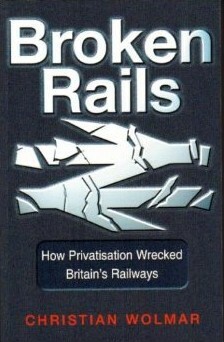 The reprinted version of Broken Rails brings the situation up-to-date, following the announcement in October 2001 that Labour finally lost patience with Britain’s rail industry and forced Railtrack, the privatised infrastructure owner, into administration. It was the culmination of five years of chaos on the railways which has reduced one of the most efficient railway operations in the world to an undignified mess, with record delays and costing taxpayers billions pounds more than under British Rail. This book is more than an account of a policy that went badly wrong; it is a savage indictment of the Tory politicians who created a disastrously flawed system and of their Labour successors who waited for over four years before attempting to put it right. Christian Wolmar concludes that the government cannot simply turn Railtrack into the not-for-profit Network Rail and leave the rest of the existing system as it is. But perhaps what is needed most of all, he argues, is recognition by the government that the railways are never going to be financially self-sufficient. As New Labour drifts towards another road building programme, despite its social and environmental consequences, it seems that we are as far from this as ever. Broken Rails is the only detailed analysis of what has happened in the rail industry in the decade since privatisation was first mooted and has become the standard work on the subject. It has even been reprinted in Japan where it has sold thousands of copies. It was shortlisted for Channel 4’s ‘Political Book of the Year’ award for 2001. A new edition, called On the Wrong Line, was later written by Wolmar.